Be the first to share your favorite memory, photo or story of JoEllen. This memorial page is dedicated for family, friends and future generations to celebrate the life of their loved one. 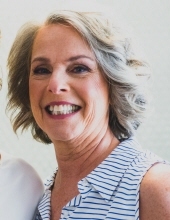 JoEllen Browning, 65, loving wife, mother, sister and friend to many, died Friday April 5, 2019. Mass of Christian Burial will be celebrated at 2 PM, Thursday, April 11, 2019 at St. Mary’s Catholic Church, 228 East Jefferson Street, Iowa City with Father Steven Witt officiating. (Please look for blue meter hoods near the church and Sunday parking will also be in effect on Jefferson Street only) Visitation will be Wednesday from 4 PM to 8 PM at St. Mary’s Catholic Church. In lieu of flowers, memorials may be directed to the JoEllen Browning Memorial Fund, c/o Two Rivers Bank & Trust, 551 Westbury Dr, Iowa City 52245. JoEllen was born February 6, 1954 in Iowa City, the daughter of Larry and Margaret (Knoedel) Wall. She was a 1972 graduate of West Branch High School and in 1976 received her bachelor’s degree from the University of Iowa. On September 10, 1976, JoEllen married Roy Browning Jr. at St. Bridget’s Church in Nolan Settlement. JoEllen is survived by her husband, Roy Jr. and their children, Matthew (Brooke) Browning of Iowa City and Elizabeth (Matt) Adrianse of Des Moines; her four siblings, Pat (Denny) Corcoran of Howell, MI, Larry (Nancy) Wall Jr. of Bend, OR, Jane Wall of Waukesha, WI and Barbara (John) Gerend of Lake Villa, IL; sister-in-law, Mary Setele of Palm Beach, FL; numerous nieces, nephews, cousins, and extended family. To send flowers or a remembrance gift to the family of JoEllen Browning, please visit our Tribute Store. "Email Address" would like to share the life celebration of JoEllen Browning. Click on the "link" to go to share a favorite memory or leave a condolence message for the family.